Do you have very cold, snowy winters? Or are you cold-blooded and can’t seem to stay warm even when you’re home? Girl, this post is for you! Sometimes it’s easiest to just reach for the biggest, fuzziest sweatshirt from hubby’s side of the closet. But that leaves you feeling frumpy! This post will show you a simple method and strategies for how to dress both warm AND cute in winter. Now hang on to your cute socks though cause this post is LOOOONG. I think it might just be the longest one on the blog so far. It’s very much focused on kid-friendly, casual and cute outfits you can wear for every day mom life and I wanted to cover the topic thoroughly! GALS. I thought I had a lot to say before starting to write. Then as I researched some more my excitement only grew to bouncy status. This is one of those posts my husband has heard me chatter about because I couldn’t just keep it to myself while writing it! First off: The simple key to dressing warm but stylish in winter is layering. But the tricky part with layering is not looking bulky and frumpy #amiright?! Or, maybe you feel like every warm piece you own is kind of frumpy? Then we’ll go into How to Dress Cute in Layers (Without Looking Bulky) along with a few of my Best Tips for Dressing Warm and Cute in Winter. Along the way, I’ll sprinkle in some clothing recommendations from Amazon to help you picture some of the pieces I’m talking about. This not only serves as visual examples but also gives you options for cute clothes with good reviews and easy shipping/returns. NOTE: On mobile only about half the Amazon links show up. View this on a computer or tablet to see more! Warm and stylish winter outfits come together quite effortlessly when you have to right pieces. 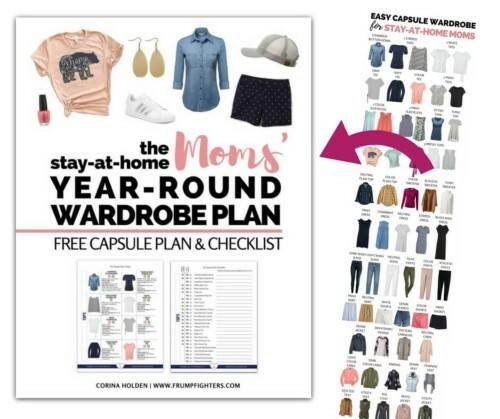 This list of winter wardrobe basics is geared toward stay-at-home moms who need casual/comfy but chic options for layering. 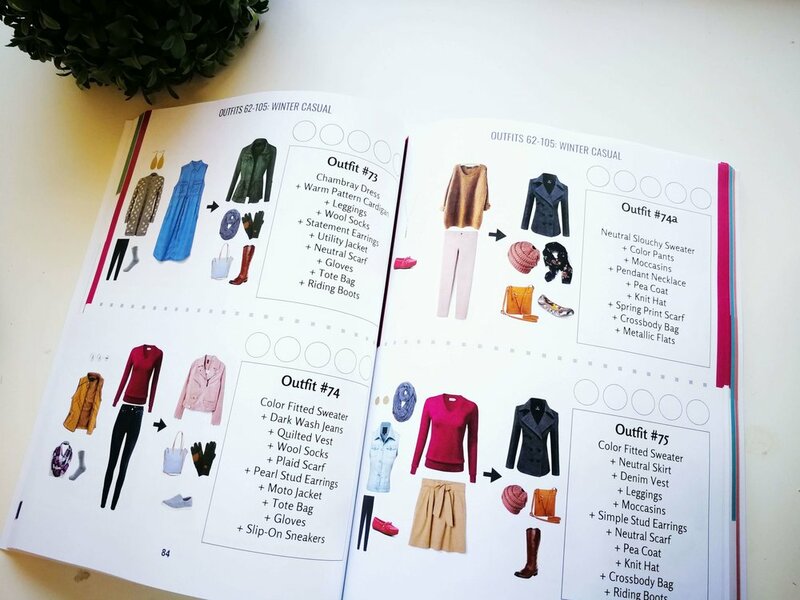 If you also work outside the home, see my Year-Round Business Capsule Wardrobe that includes a few business casual pieces for cold weather. The key with business casual is the same though… get pieces in warm fabrics and layer, layer, layer! That’s what you’ll learn to do in this post. Below each wardrobe section, I include some of my personal picks from Amazon to both give you shopping options and also help you visualize what an on-trend, stylish version of the pieces looks like. *Cute Sweatshirt/Hoodie (I love Mindy Mae’s Market sweatshirts). Use FRUMPFIGHTERS10 for 10% off your entire order! Suede is pretty but isn’t very practical for rainy or snowy weather. Leather or gum boots are most durable against the elements. Just be sure to seal your genuine leather to protect it. The most versatile ankle boots end just above your ankle bone. Taller ones are trickier to wear with skinny pants (but I’ll show you how later). Boot cut pants can be worn over any height of ankle boots. Get boots with a 1-2 inch block heel. The block style prevents twisted ankles while helping keep your feet dry in the rain and snow. Most of these pieces are included in my Stay-at-Home Mom Year-Round Wardrobe Plan. You can download that free checklist and then use the “Other” section on the printable to add the pieces that don’t have asterisks in the list above. If you live in an especially cold climate, you may want to pay attention to the fabrics of your pieces. You see, having tops, cardigans and pants in warm materials can be the difference between having to wear 3 layers or just 2 layers—thus minimizing the bulky factor. Fleece. I’ve seen fleece jackets all over the place, and few fabrics are as warm as fleece the moment you slip into it. Just make sure to get a fitted size to avoid looking frumpy in fleece jackets. Sherpa (aka faux shearling). Oh SO popular right now! You’ll find Sherpa vests and jackets easily. And it’s just about the warmest thing you can wear. Because it’s thicker than fleece, you can go for the slouchier fitted Sherpa jacket as long as you pair it with fitted bottoms such as a straight skirt or slimming jeans. Wool. To avoid the hassles of real wool and the expense of cashmere (what mom can wear CASHMERE stress free? ), look for the cheaper merino wool or its synthetic counterpart, acrylic. I have merino wool socks and an acrylic sweater that are my go-tos on damp, cold days. Faux Fur. Although not something you’d wear around the house with kids, a fake fur vest would be adorable to throw on over a thermal white shirt along with skinny jeans for date night. Corduroy. Is it still in? Yup! Still around, and especially cute in a mini skirt paired with leggings and boots! Leather (including vegan/faux leather). 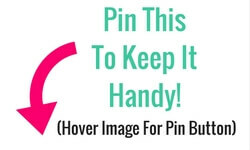 This works great in jackets or leggings to provide a windshield. Suede (including vegan/faux suede). A softer version of leather, suede in a sharp moto jacket will provide an awesome shield against the wind. Tweed. Often appears in tiny plaid print or herringbone, tweed is so warm I rarely get an occasion to wear my tweed coat. Velvet. This fabric is very popular right now. I personally can’t get into it (too reminiscent of my childhood) but if you do like it, take advantage of this trend to look stylish while staying warm. Polyester. Ever find that you sweat a lot in polyester tops? That’s because it tends to lock in moisture. In contrast, cotton wicks away moisture which causes you to feel chilly as it evaporates. Look for jeans and tops with some polyester versus 100% cotton for more warmth. You may have noticed these are all soft fabrics. A quick way of knowing something will be warm before bringing it home is simply to feel how soft it is. Stiffer fabrics don’t lock in heat very well. The key to staying warm and stylish in winter is layering. This is also the key to handling the quadrillion fluctuating temperatures moms face in any 24 hour period. It’s practical. Layering allows you to utilize pieces in your wardrobe that you usually only use in warmer seasons. 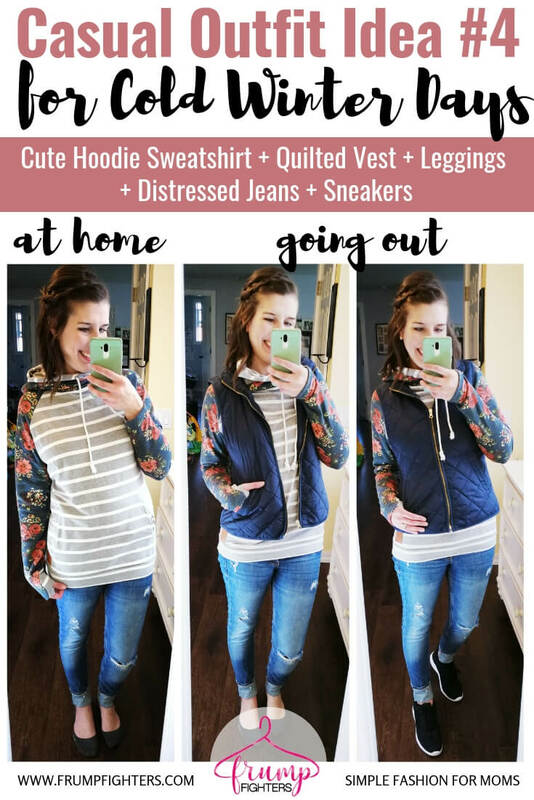 It also allows you to easily transition to a cooler outfit when you’re on the go with kids and in and out of cars and buildings. It’s stylish. I mean, one of the tips you’ll always read if you look for ways to be stylish? To layer. So rest assured, layering is not just practical, it actually makes you look like a super chic mom. I put together this visual guide to demonstrate how to layer for winter fashionably and without looking bulky. Below the chart I wrote out the explanation of the layers. IMPORTANT: The “key ingredient” here is the thermal base layer. A good quality pair of thermal “underwear” allows you to wear fewer layers while staying toasty warm. Start with thermals if you have freezing temps OR you just can’t seem to get warm around the house. Heattech thermals are recommended for being thin but very warm—and they’re quite affordable! You can also get cami and tank top style if long sleeve is too warm for you. Here are some additional options on Amazon. When it comes to thermals, cotton should be avoided because it adds bulk and doesn’t keep you very warm (due to how it absorbs moisture). Check the fabric details! Ok, now on to the chart. Skip a few layers if your winters aren’t extreme! Please include attribution to www.nowthaticando.com with this graphic. If layering a warm sweater dress for cold weather, just skip the 2nd Main Outfit Layer below and add the “going out layers” instead. If utilizing a thinner dress, you can layer with a cardigan from the 2nd Main Outfit Layer below. If wearing a collared shirt, use a sweater with a crew or v-neckline. Otherwise a turtleneck is the warmest. If turtlenecks make you feel like you’re choking, use a scarf instead to add warmth to the neck when going out. Goes over your cardigan, jacket or sweatshirt. Yes, this is a trendy thing to do! Here are some dressing hacks for looking cute and chic in very cold weather. How to wear ankle boots with wool socks and skinny pants in very cold weather: Fold thick wool socks over once or twice to about 1 inch above the ankle boot. Tuck skinny jeans or leggings into socks. You can also just wear boot cut pants over the ankle boots. Use turtleneck sweaters at home for the coziest warmth (or create one with a soft, cable knit knit infinity scarf). Wear shoes with a slim profile and slightly pointed toe (versus square or rounded toe) to avoid looking too bulky. Wear jeans with a blend of both cotton and synthetic materials (not 100% cotton). If shopping for warm pants, check materials! Or use #2 above to make any pants warmer. For athletic outfits, instead of leggings opt for thicker ponte knit pants. They are just as stretchy but much warmer! Buy accessories like scarves, hats and gloves/mittens in neutrals instead of color. That way they easily look classy added to ANY outfit and you don’t end up looking mismatched and awkward. Get one that is fitted (possibly sizing down) and comes it at the waist instead of flaring out. Get a coat with a belt at the waist in to add definition. You can also counter the (often necessary) bulkiness on the top with slim profile knee-high or over-the-knee boots that have slightly pointed toes. Get coats/parkas in black or navy rather than light colors to look slimmer. Also wear dark wash jeans or black pants on the bottom and black boots to elongate your frame. If you’d like to add color, you can do so with a scarf or statement earrings. OR, instead of trying to feel slim in a bulky parka, consider using one of your slimmer coats and layering underneath with a super warm fleece or sherpa jacket. Trendy tip: You can still wear your ripped jeans on cold days, just layer underneath with Fleece-lined leggings! Check out the Pinterest board I put together about cute skirt and dress outfits for cold weather. Okay so we’ve covered the essentials you need in winter, the warmest fabrics, how to layer, and other general tips for dressing cute in winter. Now we get to the outfit examples! I decided on these 10 outfit formulas because they are hugely popular right now and pretty fail-proof! You can add a thermal camisole or shirt + thermal pants + hat + gloves on any of these outfits for additional warmth. Having that thermal layer is key for moms with little ones at home because you can avoid wearing scarves or heavy cardigans that sometimes get in the way. My hat and gloves were in my napping son’s room so I didn’t get any photos with them on. As you can see though, a cute pom pom knit hat and gloves would complete any of these outfits! Wear wool socks folded down over your leggings for a trendy and cozy at-home look. Here I’m wearing ankle boots with warm wool socks. Simple fold down your wool socks until they are poking out about 1 inch above your ankle boots and then tuck your jeans into them. This sweatshirt is the Double Hooded Sweatshirt from Mindy Mae’s Market sweatshirts. I’m writing a review on them soon. 😍 Use FRUMPFIGHTERS10 for 10% off your entire order! For additional warmth, add a puffer jacket to this outfit. Another Double Hooded Sweatshirt 😊 I love that sizing up makes it long enough to cover the bum. If white jeans scare you, you could simply swap in other neutral jeans like black or gray ones. Leopard and classic stripes go so well together! Notice I’m wearing leggings under my ripped jeans. It’s a perfectly acceptable thing to do! These leggings are more burgundy in real life, but they look plum purple here… so I went with it! Notice this is my slouchy sweater from Outfit #3… long slouchy sweaters can double as short sweater dresses with leggings underneath! Lots of shoe options for this one… black sneakers, ankle boots and snow boots all work great with faux leather leggings! Try going monochrome like this all blue outfit and add color with a necklace! 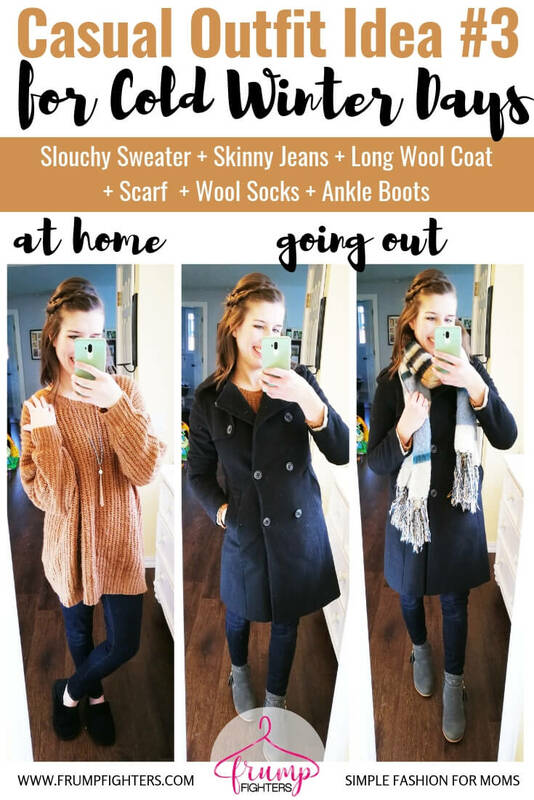 I hope these wardrobe basics, the charts on warmest fabrics + how to layer and the outfit ideas gave you plenty of inspiration to dress cute and warm this winter! It was such a joy putting it together in response to your questions.